Note： Be advised that it is located behind the battery pand which is fastened by 4 small screw, take the 4 screw out on the battery compartment and lift to insert 16 G SD.If you are on WIFI you connect to the camera quickly when the doorbell is rang, you will check it quickly, but if you are using your phone data it takes a few seconds to connect, since you have to allow it to use your phone data. Our doorbell wireless camera only can support ToSee. 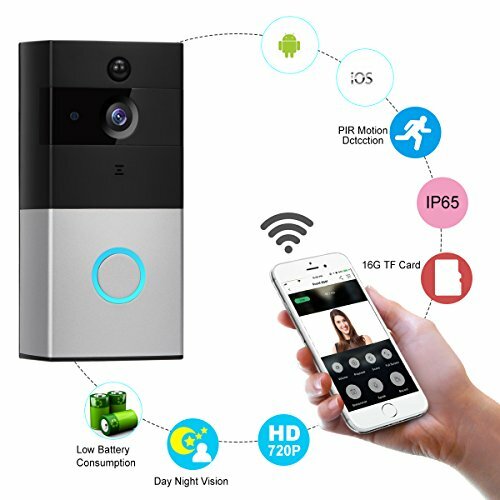 Safety & Convenience: The Visual Doorbell has motion detection, whenever any motion is detected, camera sends alert to your mobile phone, the sensitive time is adjustable.166ﹾ Lens, you could view different areas on App at any time to keep your home safe at day and night.6 LED make you can see it clearly at night. Powerful Remote Access: When someone rings to bell, you will receive a notification at your Phone or iPad, you can talk with them directly with your Phone App(Tosee), whether you are at home or not. Meanwhile, you have no awkward moments for missing Lover, Friends or Mailmen. One-click Photo and Video: We provide 16 G FT Card, making it easy to manage memory, video looping automatically overwrites the oldest video files to make room for new footage. You also could take photos and video by this doorbell, it will bring you more fun. Flexibility: Excellent solution for outdoor installations. Operates in a wide temperature range. The housing Provide IP65 compliant protection against sprayed water. Whatever in bed, doorway or anywhere. Warranty: We provide 4 months guaranteed, if you have any questions, please feel free to contact us at first. If you have any questions about this product by Akpote, contact us by completing and submitting the form below. If you are looking for a specif part number, please include it with your message.